There are a lot of superfoods available these days, but coconut oil is one of the more interesting ones. Many populations around the world thrive as a result of coconut consumption, and coconut oil has been consumed in tropical places for thousands of years. Coconut oil is made from the meat of mature, harvested coconuts from the coconut palm, and in recent years, its medicinal uses have come to light. Did you know, for example, that you can use coconut oil for yeast infections? Various studies support the long list of health benefits of coconut oil, especially for yeast infections arising from Candida albicans, a fungal pathogen. Is it Good to Use Coconut Oil for Yeast Infections? The benefits of coconut oil for yeast infections are remarkable. In a study published in mSphere in 2015, Tufts University researchers discovered that coconut oil is very effective at controlling the overgrowth of C. albicans in mice. C. albicans is thought to be an integral part of immune system regulation and the gastrointestinal (GI) tract’s flora. That said, many things can contribute to the spread of the yeast and systematic Candida, including a high-sugar diet, stress, allergies, poor digestion and elimination, and the frequent use of certain medications like corticosteroids or antibiotics. In the study, researchers tested three dietary sources of fat on the C. albicans in the GI tract of mice, including beef tallow, soybean oil, and coconut oil. A fourth group was fed a common diet for mice. The results found that a diet high in coconut oil, or coconut oil and beef tallow, reduced Candida in the gut by more than 90% when compared to the mice fed the high beef tallow diet. Also, coconut oil lowered fungal infections after the mice swapped the beef tallow for the coconut oil. The Tufts University study chose coconut oil based on previous research published in the Journal of Medicinal Food in 2007 where Nigerian researchers supported virgin coconut oil for the treatment of fungal infections, especially since the repeated use of antifungal drugs can lead to drug-resistant strains of Candida. But how does coconut oil work for yeast infections, exactly? Coconut oil has three unique medium-chain fatty acids with antifungal, antimicrobial, and antiviral properties that help fight yeast infections. For example, the lauric acid found in coconut oil converts to monolaurin, which is a compound that helps kill harmful fungi, viruses, and bacteria. Other fatty acids in coconut oil that are effective against Candida include capric acid and caprylic acid. At the same time, these powerful fatty acids leave the good bacteria and yeast alone, which benefits the immune system. Coconut oil also has antioxidant properties that help in the absorption of certain vitamins and minerals. Also, it’s safe to use coconut oil for a yeast infection while pregnant. Add it to your diet: Adding coconut oil to your diet is a no-brainer. It’s a good idea to add three to five tablespoons of coconut oil to your diet every day, but I would start with a single tablespoon and work your way up to five. A good place to start is to replace butter with coconut oil. Apply it to your skin: Coconut oil can also fight yeast infections of the skin. Simply clean and dry your affected area, and apply a small amount of coconut oil. This should be done two to three times throughout the day and into the evening. Apply coconut oil to the skin regularly until the infection has disappeared completely. You could also combine it with other infection-fighting remedies such as garlic oil, cinnamon oil, or vitamin E drops. Wash with the oil: You can also wash with coconut oil once or twice each day to help prevent a yeast infection. Simply combine three to four tablespoons of coconut oil with two quarts of warm, distilled water. Submerge a cloth into the solution and wash your affected areas. Perform the procedure as much as needed until the infection is gone. Use coconut oil capsule supplements: There are also coconut oil capsule supplements available. They are used on the body, and they melt due to body heat. It’s best to use two to three capsules at night until the yeast infection has disappeared. Will Coconut Oil Complement an Anti-Candida Diet? Coconut oil is absolutely appropriate for the anti-Candida diet, and it should be added to most protocols geared toward treating yeast infections. The anti-Candida diet is devoid of sugar or yeast-promoting foods, as sugar is known to feed Candida yeast cells, and therefore should be avoided at all costs while on the anti-Candida diet. The anti-Candida diet also doesn’t include foods dairy products, grains such as wheat, all processed foods, coffee, alcohol, honey, maple syrup, nuts (peanuts, pistachios, and walnuts), dried fruits, or pickled vegetables. Coconut oil, on the other hand, is a natural sweetener and can act as a sugar substitute to positively control the growth of yeast. However, some people may be sensitive to coconut oil, in which case you can replace it with ghee, another healthy saturated fat that can be cooked at high temperatures. Other natural sweeteners besides coconut oil include ground chicory root and powdered stevia extract. In general, the anti-Candida diet supports non-starchy vegetables such as cauliflower, broccoli, arugula, and artichokes. It also contains organic meat, wild-caught fish, organic eggs, and other healthy fat sources like extra-virgin olive oil and avocados. Aside from replacing butter with coconut oil, there are also a number of other coconut oil uses in the diet that you should know about. For example, the medium-chain fatty acids in coconut oil do not break down into trans fats, which means that coconut oil is good for cooking. The smoke point of an oil is the temperature at which it breaks down and burns. Use a tablespoon of coconut oil in your coffee or tea. Coconut oil combines extremely well in a smoothie or in yogurt. Homemade bone broth is great for yeast infections. Add some coconut oil to the mix for the ultimate in anti-yeast-infection action. Use coconut oil as a substitute for vegetable oil in many baking recipes. Try some coconut oil recipes including energy bars and coconut buttercups. Eliminate food allergies and sensitivities: Since food allergies or sensitivities can aggravate yeast infection symptoms, it’s a good idea to eliminate all possible food triggers from the diet. Dairy, gluten, and wheat are the most common food triggers. Allergens can be determined with an enzyme-linked immunosorbent assay or a food elimination diet. You can discover your sensitivities via bio-meridian testing, bio-analysis with bio-energetic testing, or a meridian stress assessment test. Garlic: The allicin in garlic is thought to be responsible for the potent antifungal activity in garlic supplementation. Studies have found that garlic is effective against C. albicans. The dosage will depend on the severity of the yeast infection, but the general recommendation is 500 milligrams to 1,000 milligrams twice per day. Milk thistle: Milk thistle can help create an environment in the body that makes it difficult for Candida to thrive. Certain medications and cancer treatments will lead to a Candida overgrowth. Milk thistle will cleanse the liver of medications, heavy metals, and the aftereffects of radiation and chemotherapy. Lavender oil: In a study published in the journal Medical Mycology in 2005, researchers found that lavender oil inhibits Candida growth and prevents the spread of the infection. There are also other essential oils used for yeast infections such as oregano oil, clove oil, myrrh, chamomile, rose, and tea tree oil. Homeopathy: Candida albicans is a homeopathic preparation designed to stimulate the immune system in order to target Candida and yeast infections. The recommended dosage is 6x, 12x, or 30x three times daily until the infection is controlled. Probiotics: Gastrointestinal flora has a major impact in anyone’s health, therefore maintaining a good balance of bacteria in the gut can go a long way in the treatment of yeast infections. A high-quality probiotic can help support overall health, and can help treat and prevent Candida overgrowth. Berberine-containing plants: The alkaloid berberine is a natural antibiotic that has been found to be effective against bacteria. Examples of berberine-containing plants include goldthread, Oregon grape, barberry, and goldenseal. Volatile oils: Certain enteric-coated volatile oils contain potent antifungal agents, including oregano, thyme, peppermint, and rosemary. Oregano oil in particular has been found to have 100 times more potency than caprylic acid, which is also a compound found in coconut oil. Other home remedies for yeast infections: Some other treatments you can try include cranberries, boric acid, apple cider vinegar, olive leaf extract, calendula, vitamin C, digestive enzymes, betaine HCl (hydrochloric acid), propolis, pau d’arco, Echinacea, wormwood, gentian root, grapefruit seed extract, ginger, fennel, cardamom, coriander, and turmeric. Yoga, meditation, and acupuncture can also complement an anti-Candida protocol. Acne and skin conditions: Coconut oil for acne is another benefit, and can help treat skin disorders such as acne and eczema. A study published in the Journal of Dermatological Science in 2014 found that the lauric acid and capric acid in coconut oil demonstrated anti-inflammatory and antibacterial effects against acne, and can protect and moisturize the skin. 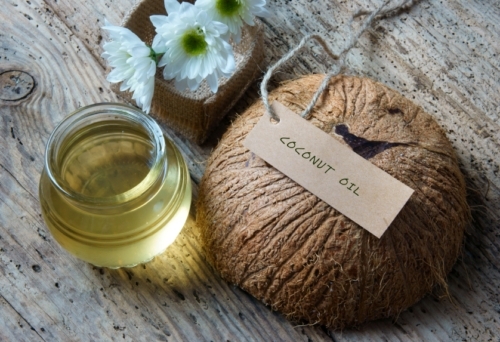 Another study published in the International Journal of Dermatology in 2014 found that virgin coconut oil had a stronger effect in eczema patients than mineral oil. Gums and dental health: The antiviral and antibacterial activity in coconut oil is effective in the treatment of gum and oral health. Research has found that coconut oil can improve the health of your gums. For instance, a study published in the Journal of Indian Society of Periodontology in 2014 found that massaging coconut oil into your gums daily for three weeks can significantly decrease Streptococcus mutans, the bacterium responsible for tooth decay. As a result, you may want to consider using coconut oil as a toothpaste. Weight loss and metabolism: The medium-chain fatty acids in coconut oil can significantly reduce appetite and increase the body’s ability to burn fat, which may affect long-term weight loss. Coconut oil is thought to be particularly effective in the reduction of abdominal fat. In a study published in the journal Lipids in 2009, researchers found that a daily dose of 30 milliliters of coconut oil significantly reduced waist circumference and body mass index over a 12-week period in 40 women with abdominal obesity. Digestive health: The medium-chain fatty acids in coconut oil also help improve digestion, as they are better absorbed in the digestive tract than long-chain fatty acids. In fact, in some cases, as with Crohn’s disease, long-chain fatty acids were found to worsen the condition. Medium-chain fatty acids also improve fat absorption in those who have had a partial or full colon removal. Alzheimer’s disease and brain health: A study published in the journal Neurobiology of Aging in 2004 found that the medium-chain fatty acids in coconut oil led to the immediate improvement of brain function in patients with a mild form of Alzheimer’s disease. As a result, symptoms were relieved since those fatty acids are thought to increase blood levels and ketone bodies, which supply the brain cells with energy. High cholesterol: The saturated fat in coconut oil is thought to increase HDL (“good”) cholesterol, while changing LDL (“bad”) into a non-life threatening subtype. The previous Lipids study mentioned also found that coconut oil reduced total and LDL cholesterol, and increased HDL cholesterol. The improvement of cardiovascular risk factors may also decrease the overall long-term incidence of heart disease. Bladder infections: It’s possible to use coconut oil for bladder infections, as its antimicrobial benefits may be able to protect the bladder and kidneys, but the data on its benefits for this condition is inconclusive. It’s a good idea to talk to your doctor first before using this remedy. Other benefits of coconut oil: Coconut oil may also be used in the treatment of epilepsy and kidney infections, and to protect the hair and skin against damage. The type of coconut oil matters. Organic virgin coconut oil has the most benefits. Do not use hydrogenated coconut oil that is high in dangerous trans fats. Organic virgin coconut oil is also free from toxins such as pesticides, as well as other chemicals. This is my secret weapon against Candida and yeast infections. Coconut oil is very effective when used in oil pulling, which is a traditional Indian folk remedy and involves swishing the oil around your mouth like a mouthwash for about 20 minutes at a time. When used this way, coconut oil is a great for “pulling out” the fungi, viruses, and bacteria that get lodged inside your mouth. It’s also used to prevent bleeding gums. Coconut oil fights yeast infections due to its unique medium-chain fatty acid content, including lauric acid, capric acid, and caprylic acid. Coconut oil can be added to the diet, used on your skin, or can be taken as a supplement in capsule form. Coconut oil is very versatile in the diet, and can be used in hot drinks, smoothies, baked goods, bone broths, and cooking eggs, stir-fries, or other dishes. Besides coconut oil, there are other natural remedies for yeast infections such as garlic, lavender oil, homeopathic candida albicans, and certain herbal remedies such as milk thistle and berberine-containing oils. Balch, J., et al., Prescription for Natural Cures: A Self-Care Guide for Treating Health Problems with Natural Remedies Including Diet, Nutrition, Supplements, and Other Holistic Methods (Hoboken: John Wiley & Sons, Inc., 2004), 128–133. Murray, M., M.D., et al, The Encyclopedia of Natural Medicine (New York: Atria Paperback, 2012), 376–387. Gunsalus, K., et al., “Manipulation of Host Diet to Reduce Gastrointestinal Colonization by the Opportunistic Pathogen Candida Albicans,” mSphere, 2015; doi:10.1128/mSphere.00020-15. Ogbolu, D.O., et al., “In vitro antimicrobial properties of coconut oil on Candida species in Ibadan, Nigeria,” Journal of Medicinal Food, 2007; doi:10.1089/jmf.2006.1209. D’Auria, F.D., et al., “Antifungal activity of Lavendula angustifolia essential oil against Candida albicans yeast and mycelial form,” Medical Mycology, 2005; doi:10.1080/13693780400004810. Huang, W.C., et al., “Anti-Bacterial and Anti-Inflammatory Properties of Capric Acid Against Propioniberterium Acnes: A Comparative Study with Lauric Acid,” Journal of Dermatological Science, 2014; doi:10.1016/j.dermsci.2013.10.010. Evangelista, M.T., et al., “The Effect of Topical Virgin Coconut Oil on SCORAD Index, Transepidermal Water Loss, and Skin Capacitance in Mild to Moderate Pediatric Atopic Dermatitis: A Randomized, Double-Blind, Clinical Trial,” International Journal of Dermatology, 2014, doi:10.1111/ijd.12339. Singla, N., et al., “Effect of Oil Gum Massage Therapy on Common Pathogenic Oral Microorganisms – A Randomized Controlled Trial,” Journal of Indian Society of Periodontology, 2014; doi:10.4103/0972-124X.138681. Assuncao, M.L., et al., “Effects of Dietary Coconut Oil on the Biochemical and Anthropometric Profiles of Women Presenting Abdominal Obesity,” Lipids, 2009; doi:10.1007/s11745-009-3306-6. Reger, M.A., et al., “Effects of Beta-Hydroxybutyrate on Cognition in Memory-Impaired Adults,” Neurobiology of Aging, 2004; doi:10.1016/S0197-4580(03)00087-3. Gallagher, S., “Study in Mice Suggests Coconut Oil Can Control Overgrowth of a Fungal Pathogen in GI Tract,” Tufts Now web site, Nov. 18, 2015; http://now.tufts.edu/news-releases/study-mice-suggests-coconut-oil-can-control-overgrowth-fungal-pathogen-gi-tract, last accessed April 13, 2016.